Thank you to everyone who participated in the parade & to those who came out in support of the parade entries! Musical / Bands - Bedford North Lawrence Marching Stars. 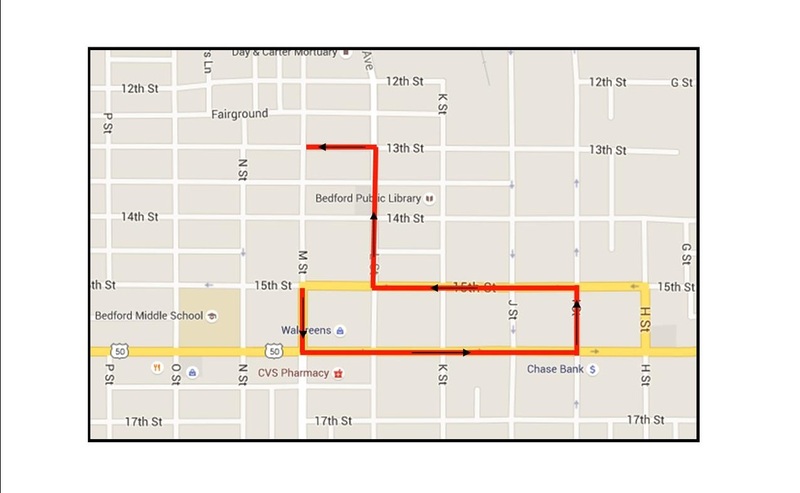 2018 Theme - "Twas the Night Before Christmas"
Bring a chair and enjoy the parade along the route marked in red. Over 100 parade entries will be on display, including floats, musical, equestrian, classic cars, antique tractors, fire trucks, police vehicles and more! All entries are adorned with lights, during Southern Indiana's Largest illuminated Christmas parade! PLEASE CHECK IN AT THE CORNER OF 14TH & M STREET WITH A MEMBER OF THE BEDFORD LIONS CLUB. They will provide you with the line up area that your entry is assigned to. You will receive your parade number once you are positioned in the line up area on parade day. Parade Line up is subject to change. If you do not see your name listed below, we do not have record of your parade entry form. Please submit an online entry by clicking here. For any questions please EMAIL parades@downtownbedford.org or leave a Voicemail message at 812-329-4221 and a volunteer member of our committee will return your call. 31 Little Theatre of Bedford presents "An Enchanted Christmas"
76 B & D Waste Removal Inc.
77 Stalker Cheer, Dance, and Basketball. 104 "A Beautiful Story Written in Velvet"